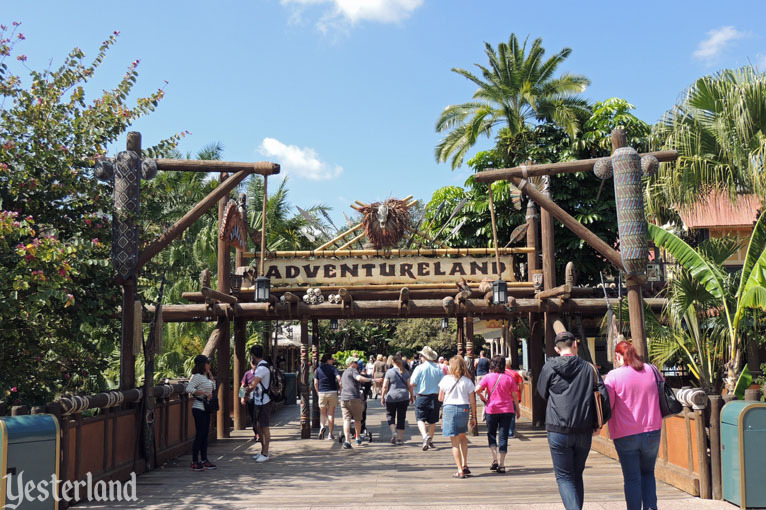 This time, we’ll start at the park entrance and head to Adventureland, revisiting the same spots where Chris Bales took photos in 1996.
, Curator of Yesterland, March 25, 2016. 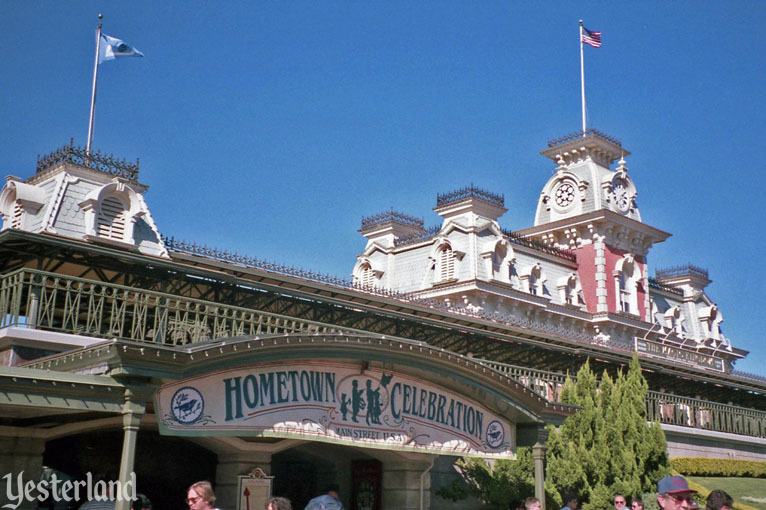 The 1996 photo shows that a second planter used to be in front of the floral Mickey planter, with a walkway between the two. Do you see the people on the walkway? The big trees in the 1996 photo are gone in its 2016 counterpart. 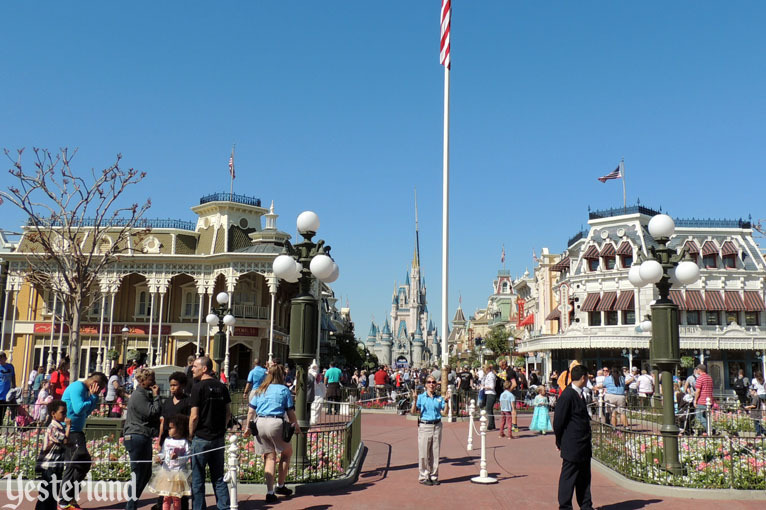 Does anyone remember the Hometown Celebration on Main Street, U.S.A.? The event featured character greetings at Town Square, Alice in Wonderland’s Tea Party at the landing across from the Plaza Ice Cream Parlor (not the teacup ride, but an actual tea party), sidewalk chalk art, a checkers contest, face painting at Main Street Station, and the Custodial Drill Team March prior to the Mickey Mania Parade. On the 2016 photo, the most obvious difference is that there’s no banner. But look more closely. The iron fence along the railroad track is taller and has a simpler design. 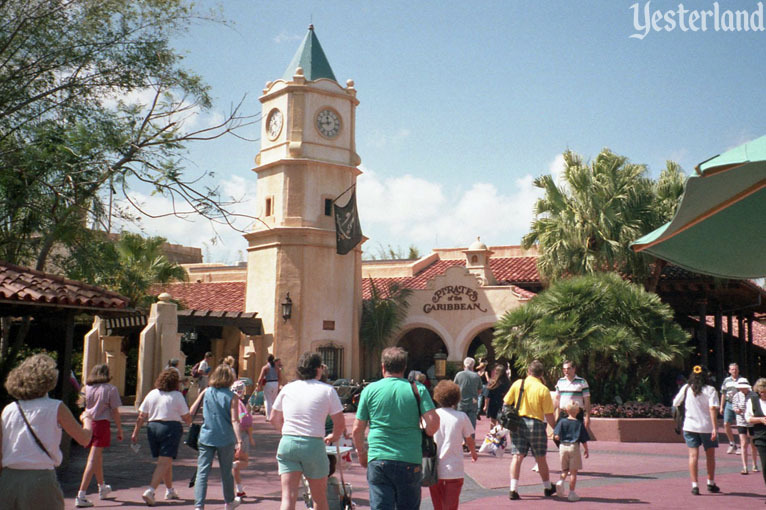 The big trees that were in Town Square in 1996 are gone. Apparently, this provides better views of the nighttime sky for fireworks. 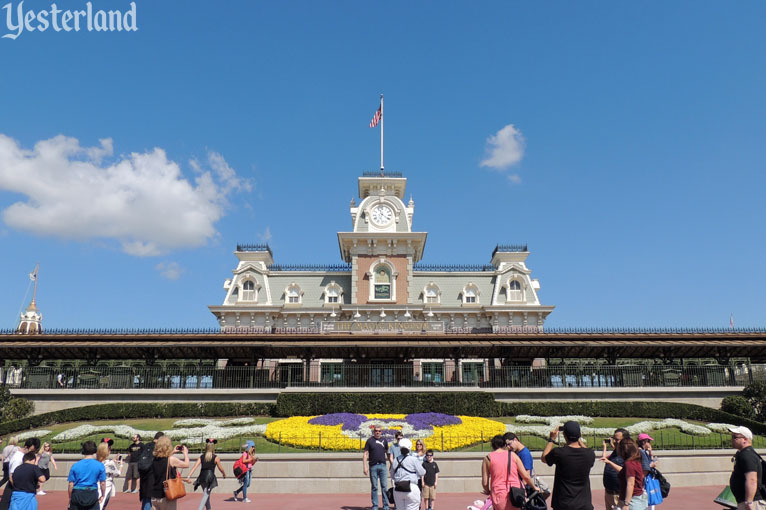 The photos make it seem that Cinderella Castle grew taller between 1996 and 2016. But the height of the tallest castle spire is unchanged. There’s just a crane behind the castle for routine maintenance. 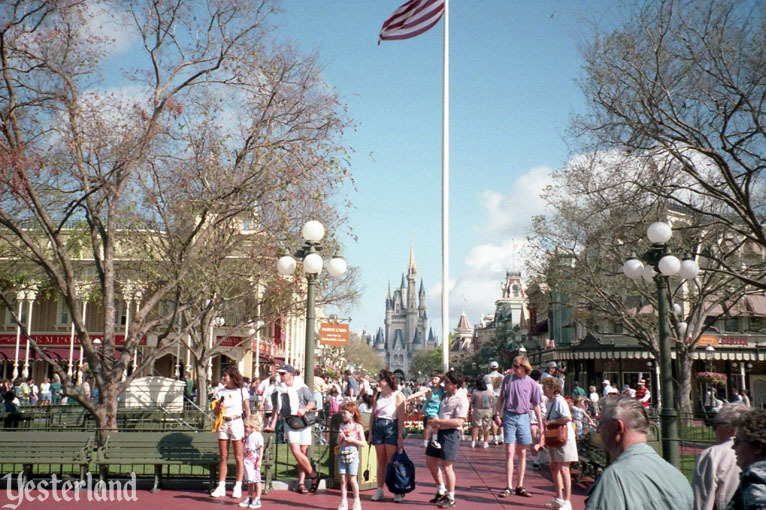 In the 1996 photo, a red sign marks the load area for horse cars to Cinderella Castle. 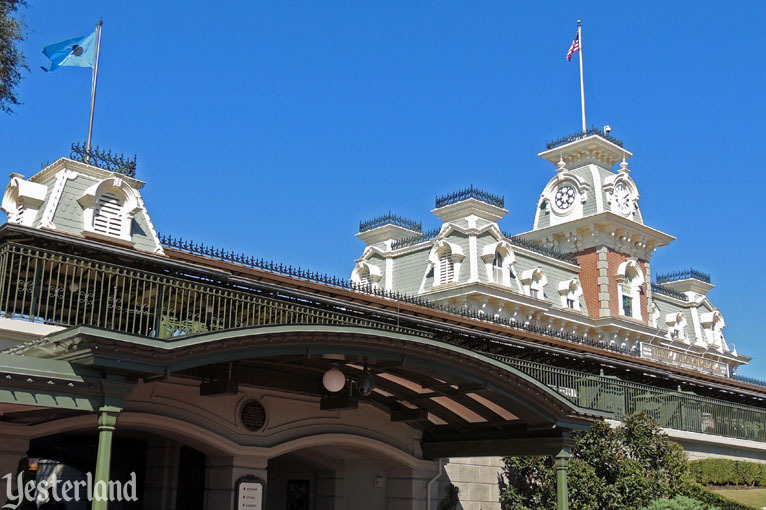 There’s now a speaker on the same street light—part of the proliferation of speakers throughout the Magic Kingdom. The bridge from the Hub to Adventureland is one of those things that seems to be unchanged since opening day. But, in reality, the sign and decorations are quite different. 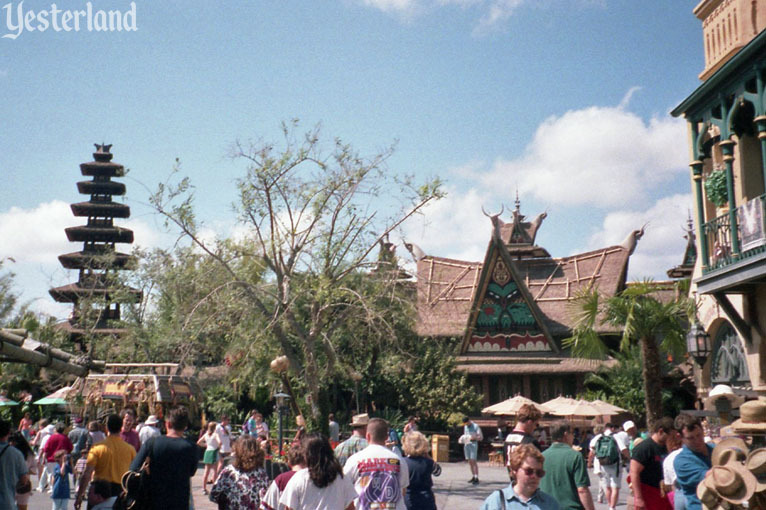 Compared to the tight spaces of Adventureland at Disneyland, the East Coast version had plenty of open space—including a big plaza in the middle. 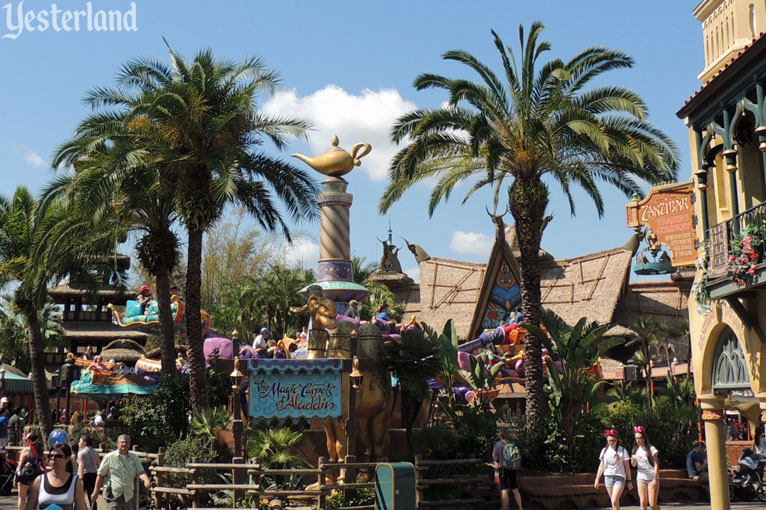 With long lines at Dumbo The Flying Elephant, enough room for another spinner ride, and the enduring popularity of Disney’s Aladdin (1992), it made sense to add The Magic Carpets of Aladdin to Adventureland. Some buildings in the area already had exotic, vaguely Middle Eastern architecture that could pass for Agrabah, while others took their architectural inspiration from Polynesia. The ride opened in May 2001, complete with spitting camels. 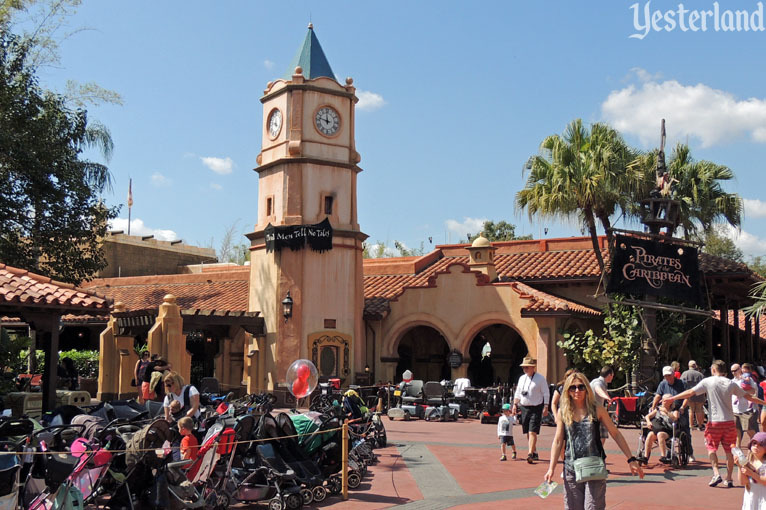 At Disneyland, Pirates of the Caribbean is part of New Orleans Square, but at the Magic Kingdom, it’s in Caribbean Plaza, a subland of Adventureland. At some point between when the two photos above were taken, someone decided that the sign and banners for Pirates of the Caribbean needed to be changed. Tropical Serenade at the Florida Citrus Growers’ Sunshine Pavilion was an opening day Magic Kingdom attraction. 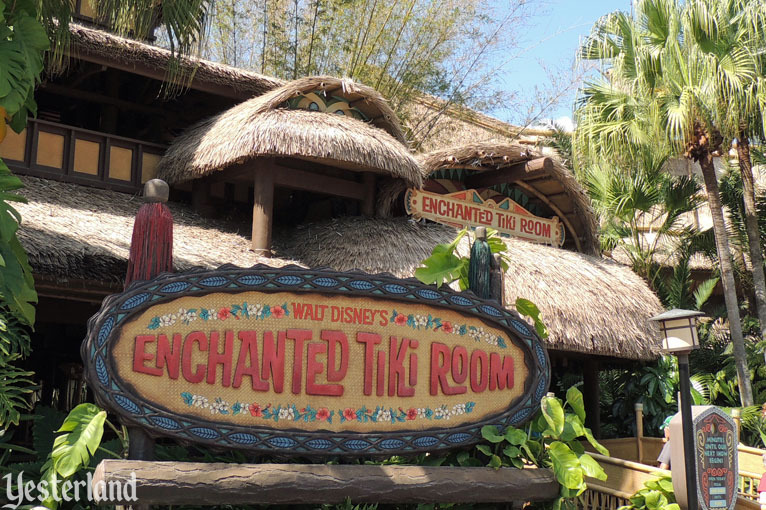 Despite a different name and a different pre-show, the main show was the same as Disneyland’s Enchanted Tiki Room. 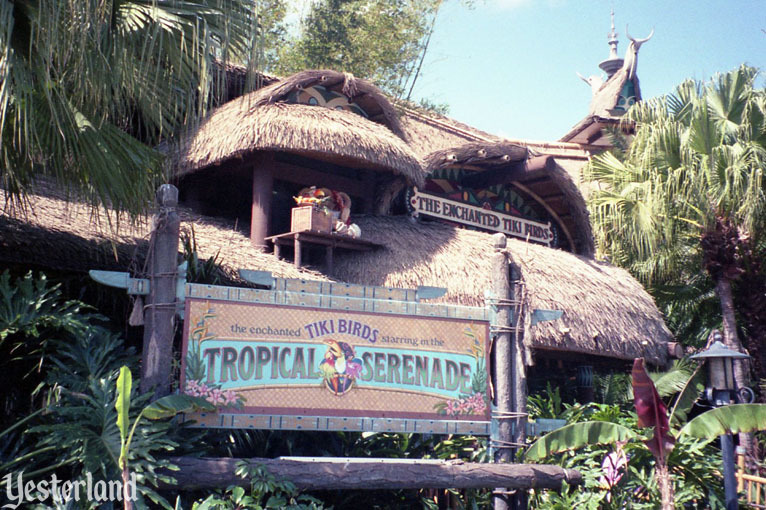 Tropical Serenade closed in September 1997, to reemerge the following spring as The Enchanted Tiki Room—Under New Management. It must have seemed like a good idea to the executives who approved it and the Imagineers who reworked it. But gone were the “Aloha” spirit, good-natured silliness, and timeless music. Instead, there was cynicism, mean-spirited dialog, and pop music that was immediately stale. The revamped show lasted until January 2011, when an electrical fire knocked it out. The repaired attraction reopened August 2011. New managers Iago and Zazu were gone. Tropical Serenade was back with the same name as at Disneyland, just shortened and without the water fountain. And that’s why the two photos above have different signs for essentially the same show. 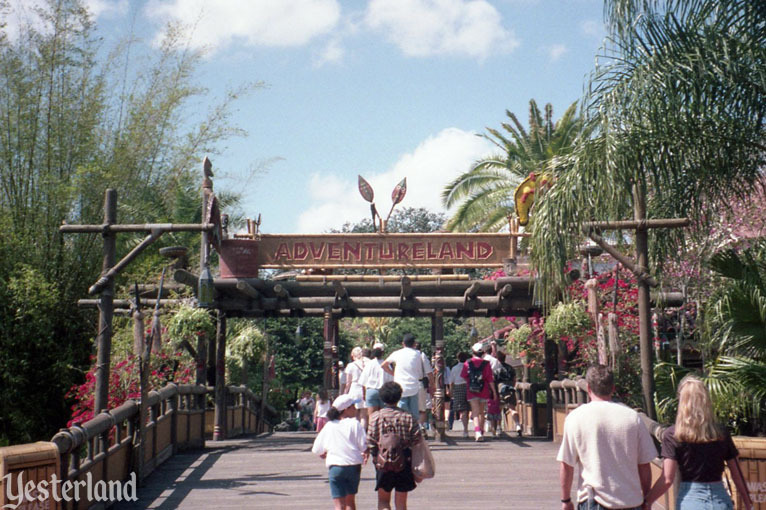 Yesterland has many other “then and now” photo essays—for Disneyland, Disney California Adventure, Magic Kingdom Park, Epcot, Universal Studios Florida, Universal Islands of Adventure, and Knott’s Berry Farm. You can start with the links below. 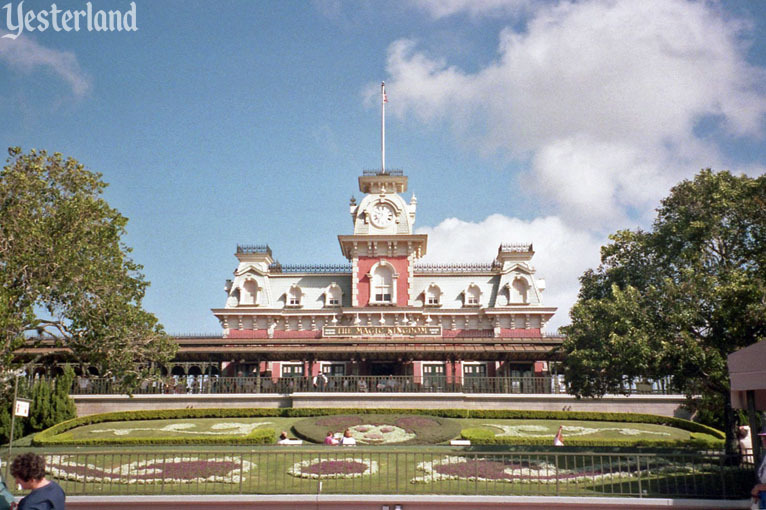 Then visit the Yesterland home page for a list of all Yesterland articles.